JVC LT-37DV1BJ review | What Hi-Fi? JVC keeps it a little simpler than most TV manufacturers. 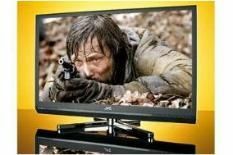 Its website is carrying some 14 TVs at the time of writing – a rather meagre number compared with some of the players in the market. This is the more strongly equipped of the two 37in sets in its arsenal, with a price to match, so it has work to do. It gives itself plenty of chance on paper, with a 1920 x 1080 Full HD resolution panel, JVC's 100Hz Clear Motion Drive II, three HDMI inputs, a USB input and a wealth of audio and video processing technologies. Last, but not least, you can even turn this set off by clapping your hands. It looks smart, but that smooth swivel stand is a complete pain in the posterior to set up. It fits together in a decidedly wobbly fashion and is completed by one small bracing plate that adds little to the overall stability. Still, provided you leave well alone once it's done, you shouldn't have too many probems with it. The slender remote matches the classy styling of the TV with a white back-panel and a pleasant feel in the hand. On screen, JVC's menus have been given a little re-jig but we're not completely taken with them ourselves. More worryingly, each button press is just a fraction slow to respond. With all this behind us we settle down to enjoy the picture. And enjoy it we do, with vivid colours and strong blacks helping to deliver a dynamic, absorbing rendition of 500 Days of Summer. There's decent detail to faces, motion is handled smoothly and it's fairly sharp around the edges. But does it knock our socks off like some close rivals? Not really, no. We watch a spot of daytime TV, and there's plenty to like about the off-air images, too. There's good insight, lively colours and smooth motion, but edges could be drawn a little sharper. Some competitive tuners offer a more stable, solid picture. Sonically it's fine, delivering a fairly clean, detailed soundstage. This JVC set falls at the classic price hurdle. In isolation it's a more than competent screen, but we can't find the extra level of performance to justify the higher price tag. Unless you're desperate to have your telly respond to your handclap, we'd suggest you can find better value elsewhere.